Syrian medical specialists have found no trace of chemical weapons having been used in Eastern Ghouta, a member of the Red Crescent, who worked for the last seven years at the central hospital of Douma in Eastern Ghouta, told journalists. "I have spent seven years working at the central hospital in Douma. At some point, our [hospital] received six people, who were allegedly suffering from respiratory problems. Following a medical examination, we did not find any problems at all, any traces of chemical agents," Saif al-Deen Hobiya, a member of the Red Crescent, said. Recalling the events that took place in January, he said that they had “no evidence of chemical agents being used in the area." Back in January, former US Secretary of State Rex Tillerson accused the Syrian authorities of allegedly using chemical weapons against civilians in Eastern Ghouta earlier that month. 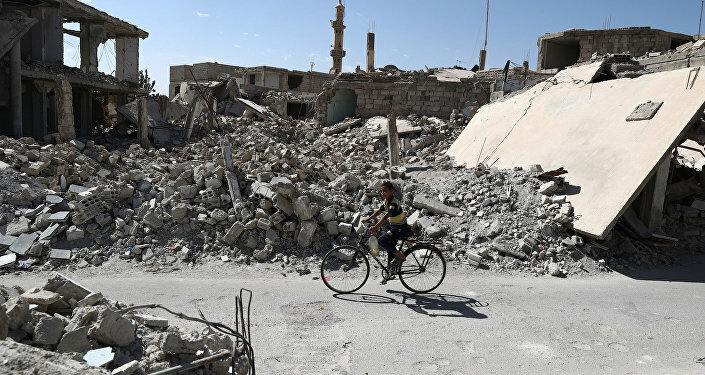 Several opposition news portals and the Qatari television network Al-Jazeera earlier reported, citing militant sources on the ground, about an alleged chlorine gas attack by Syrian government forces that, had supposedly, killed dozens of civilians. The Syrian Defense Ministry then responded by saying that the US allegations on the use of chemical weapons by Damascus were based on hearsay and testimonies by jihadist militants, and had never been backed up by hard facts. "Allegations of chemical use have become an unconvincing broken record, except for some countries that trade with the blood of civilians and support terrorism in Syria. Every time the Syrian Arab Army advances in the fight against terrorism, allegations of chemical use are used as an excuse to prolong the life of terrorists in Douma," the state news agency SANA quoted a ministry source as saying. The Russian Reconciliation Center for Syria has repeatedly denied reports of a chlorine bomb allegedly being dropped on Douma by government warplanes and is ready to send its specialists in radiation, chemical and biological defense to the area to collect data that will confirm these claims are fabricated. In Moscow, the Russian Foreign Ministry has dismissed the allegations about the use of chemical weapons by Damascus as an attempt to help the terrorists and justify possible military intervention in Syria from abroad. Gerasimov added that the US could use the fake attack as a pretext for striking out at government quarters in Damascus.